Last month I was up in Reno at my dad's wedding. We all stayed at Circus Circus. The casinos, though, are smart about keeping people inside to shop and eat at only their establishments. The casinos have sky bridge connectors where many of the restaurants are located. On the sky bridge to the Silver Legacy's hotel is Fairchild's Oyster Bar. Our first night we were looking for more of a casual restaurant since we had a child with us. Luckily all of us enjoy seafood. A quick look at the menu showed lots of selections at reasonable prices. The Yelpers gave it pretty good reviews and there wasn't a huge wait to be seated, even with a larger party of six. We started out with a nice bread selection. There were white and wheat batons (bread sticks like the kind at Olive Garden) as well as traditional, pencil-thin, crisp breadsticks. We were there for a late dinner and were happy to munch on these for a while. A couple of people had the clam chowder. 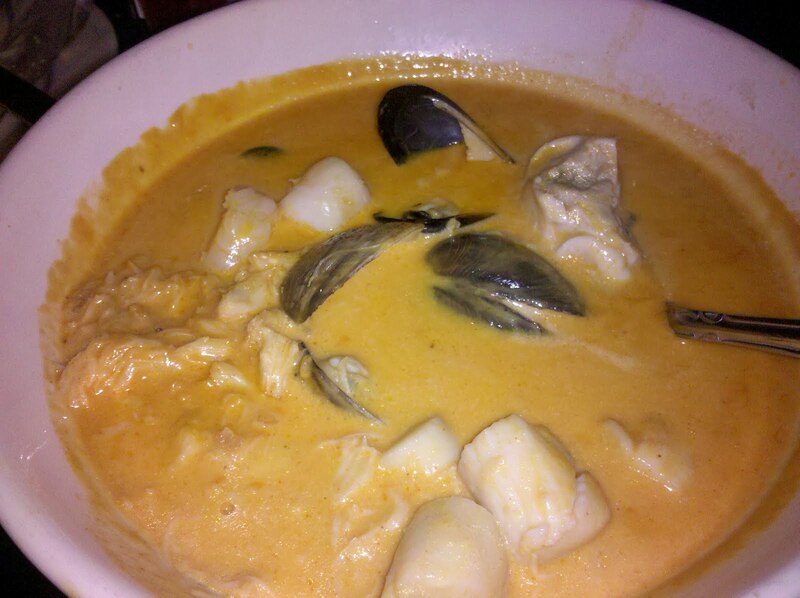 It was thick, creamy, and had a nice amount of clams so you weren't left hunting. 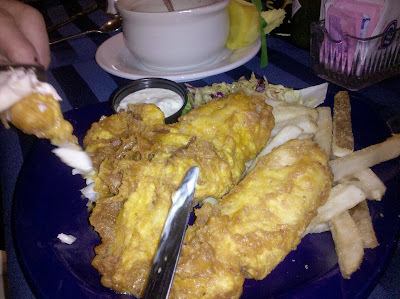 My dad is British and so it was no surprise that he ordered fish and chips. Out came several large pieces of halibut. They had a nice thick, but not to thick, coating of crispy batter. And it was definitely crispy with minimal grease. He was very happy with it. 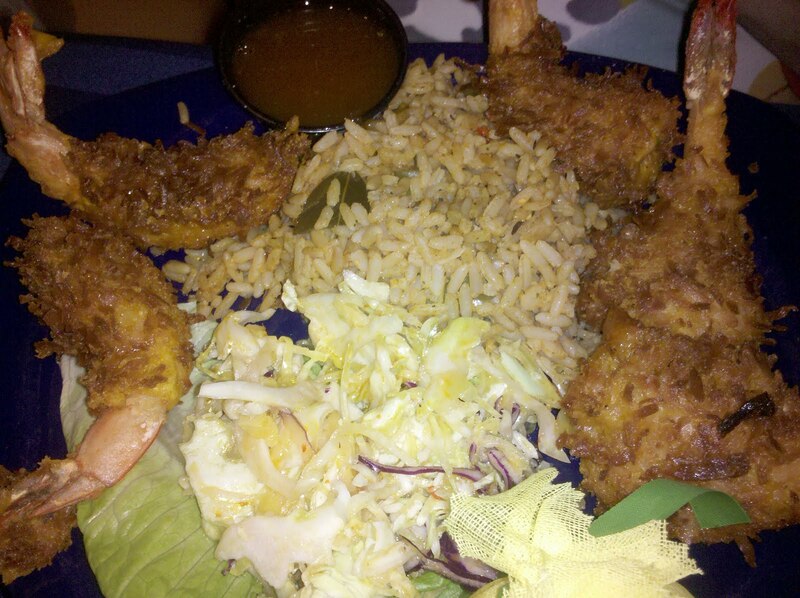 His new wife chose the coconut prawns. She received six large prawns covered in a sweet coconut batter. They were also nice and crispy. Both of their dishes came with a nice pile of perfectly cooked fries. The restaurant is known for its pan roasts. Now I'm not sure why they are called pan roasts when they are really more of a seafood stew. Very much like a cioppino, but with a lot of cream and wine. Maybe like a French cioppino. Anyway, they have many versions depending on what kind of seafood you like. I ordered the combination because I wanted everything in it. Out came a large bowl full of this thin but creamy broth with lots of seafood. Some Yelpers say it's too much for one person, but I found that not to be true and I'm a small eater. The key is to pick out your seafood and not too much of the very rich broth. The broth is very rich with cream and wine, but has a nice kick to it spices. I'd say there is a good amount of paprika to give it the reddish pink color. Overall we were very pleased with our meal and had not one complaint. Service and the food were good. So if you are willing to be confined in the casinos, Fairchild's is not a bad choice.